Boar Reinforced Bristle Rounder 1 3/4" ~3 inch short to long Hair Brush. The softened bristle penetrate, hold and style like no other bristles around. The reinforced boar bristle are slightly offset and pick up and work through the hair better. You might not see the difference, but you sure will FEEL IT. Small to large diameter for short to long hair. this brush handle is comport rubber . Hairart Brush Row 12, Hairart have produced this static free brush to eliminate static from the hair when styling. 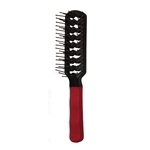 Features include a non-slip rubber grip handle which gives comfort and control, non-tangling bristles with soft tips. Hairart Vented 9 row Brush , Hairart have produced this static free brush to eliminate static from the hair when styling. 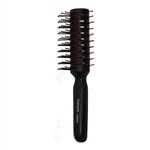 Features include a handle which gives comfort and control, non-tangling bristles with soft tips, ultra light for fast drying.